There are many hotel options for visitors to choose among when planning their ultimate Disneyland theme vacation. By knowing what options are available, guests can customize their getaway to suite their budget, family, and preferences without sacrificing comfort and convenience. Whether you choose one of the Disneyland Resort properties or a nearby hotel, you're sure to find a great home base for your trip. Disneyland Resort Hotels are part of the Disneyland Resort, which includes Disneyland, California Adventure, and Downtown Disney. Which Countries Have Disney Theme Parks? They are only steps away from the park gates, which saves time. Visitors staying at any Disneyland Resort hotel can enter California Adventure through a special gate located in Disney's Grand California Hotel & Spa. 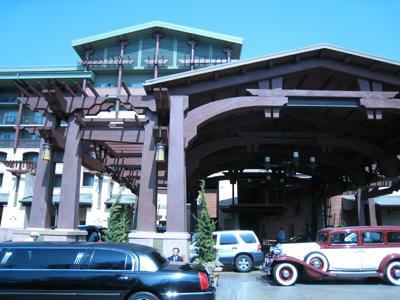 Choosing a resort hotel eliminates the aggravation of traffic and parking at the parks. Resort guests can easily return to their hotel room for any forgotten items, a quick nap, or just a break from the excitement of the day. Disneyland hotels offer guests one-hour early admission to the parks on select days, so you can beat the crowds. Guests at Disneyland Resort Hotels can participate in character dining experiences and other park-themed activities. Vacation package specials are often available. The hotels provide an immersive Disney experience. Disney's Grand Californian Hotel & Spa is the most luxurious of the three Disneyland resort hotels. It is located steps from Disney's California Adventure theme park and Downtown Disney. Rates for a standard room without park tickets are around $620 per night for a family of four. This beautiful hotel is built in the American Craftsman style with traditional woodcrafts that mimic nature and California in a restful and sophisticated way. The hotel has more than 1,000 rooms and over 40 suites. The hotel is themed as a rustic lodge, complete with a grand fireplace in the main lobby and extensive use of beautiful woods and mission style decor. The natural theme is carried to the pool and hot tub area where a redwood-themed waterslide offers a quick splash on a hot summer day. Luxurious touches can be found throughout this resort, while the classic Disney accents are extremely subtle. Make sure you check out the shower curtains for a peek at some favorite woodland creatures. The hotel has a number of special amenities available to guests. Some amenities may require additional fees. The classic Disneyland Hotel is the original resort at Disneyland. It is a fun, family-friendly resort hotel with a number of amenities. Rates for a standard room without park tickets are around $450 per night for a family of four. Disney acquired this hotel in 1988 and made it part of the Disneyland Resort in 1999. The hotel has 990 rooms including large, three-bedroom suites. The hotel is made up of three high-rise towers with park, pool, and city views. The Disney theme is prominent, with classic and fun touches throughout the property, from the sorcerer's hat statue to mouse ear mosaics. Small touches, such as using the classic fantasy font for the Disneyland Hotel name, create an overall fairytale world as soon as guests enter the door. The hotel has many amenities. Some may require an additional charge. Tangaroa Terrace is a quick dining establishment with an island flavor. Trader Sam's is a Jungle Cruise themed lounge with a full-service bar. Steakhouse 55 features prime cuts of beef, chops, seafood, and wine. Goofy's kitchen is a family friendly all-you-can-eat buffet style restaurant, with character visits. The Coffee House offers specialty coffee drinks and breakfast pastries. Disney's Paradise Pier Hotel blends the fun-loving California beach lifestyle with Disney's colorful, fantasy atmosphere. This hotel is named after the waterfront area at Disney's California Adventure. The hotel overlooks this part of the park. The hotel opened in 2000. Rates for a standard room without park tickets are around $450 per night for a family of four. Rooms are designed with a casual, beachy feel. The hotel has nearly 500 rooms and suites. Palm trees wave throughout the property. The hotel has a number of rooms that fit families, sleeping as many as five guests. The hotel offers a number of amenities and services. The beach theme is carried into the hotel's three dining establishments. Disney's PCH Grill offers family friendly dining with character breakfasts. Surfside lounge is the hotel's beach themed cocktail lounge with a full bar. Slurpin' USA is a pool side fast food restaurant that offers snacks and beverages. For more information about the different hotels at Disneyland, including comparative charts, virtual tours, reservation availability (rates vary widely), and lists of current good neighbor hotels, interested guests can visit the official hotels website. For reservations at the official Disney resorts, guests can also call (714) 956-MICKEY to plan their dream vacation. Guests who aren't interested in staying at an official Disney resort do have many options for other area hotels. To ensure their guests' comfort and happiness, Disneyland has reviewed many local hotels and certified those that meet their quality and customer service standards as "good neighbor hotels." These hotels range from a few blocks to a few miles from the parks, and free shuttles are available for guests' convenience. More than three dozen hotels qualify as good neighbors. The moderately priced Anaheim Marriott Hotel (rooms start at about $150 per night) is about three blocks from the Disneyland Resort. Shuttle service to the Disneyland Resort is available. The hotel is within walking distance of the Disneyland Resort. The hotel has 1,030 rooms. Some rooms have views of Disney's fireworks show. Guest rooms have either one king or two double beds. The hotel does offer Disneyland packages. The hotel has an outdoor pool and spa. A fitness center is available. The hotel does have pet-friendly rooms available. The Anaheim Portofino Inn & Suites is a moderately priced (rooms start at around $90 per night), family-friendly hotel. The hotel is located one block from Disneyland. It is within walking distance of the Disneyland Resort. The hotel offers two-room family suites with bunk beds that accommodate up to six people. The suites offer Disney packages. 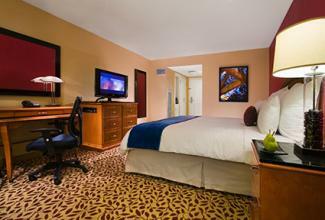 The Anaheim Residence Inn Maingate is a moderately priced (rooms start at around $130 per night), family friendly hotel. The hotel is located within one mile of the Disneyland Resort. A shuttle is available to the Disneyland Resort. The hotel allows pets with a pet deposit. The hotel has an onsite playground. A swimming pool is available. The Motel 6 Anaheim Maingate is a budget (rooms are around $60 per night) motel located less than half a mile from the Disneyland Resort. It has an outdoor pool and hot tub. There is a shuttle that goes to Disneyland daily. There is a small charge for the shuttle. The motel offers discounted multi-day passes to the Disney parks. The motel is within walking distance of the Disneyland Resort. With so many choices, you can find the perfect lodging for your family's Disneyland Resort vacation. Whether your traveling with pets or want to cook your own meals, there's a nearby hotel that meets your needs and budget.